A short overview on this solemnity of Easter. The glorious resurrection of the Lord is the key to interpreting his whole life, and the ground of our faith. Without this victory over death, says St. Paul, all our preaching would be useless and our faith in vain. Furthermore, the guarantee of our future resurrection is secured upon the resurrection of Christ, because although we were dead through sin, God, full of mercy, moved by the infinite compassion with which he loved, gave us Christ...and He raised us with him. Easter is the celebration of our Redemption, and therefore the celebration of thanksgiving and joy. And Jesus Christ lives. And this crowns us with happiness. This is the great truth which fills our faith with meaning. Jesus, who died on the cross, has risen. He has triumphed over death; he has overcome sorrow, anguish and the power of darkness... In him we find everything. Outside of him our life is empty (J. Escriva). The Church celebrates this feast beginning at the Easter Vigil on Holy Saturday and through the Octave of Easter. From Easter Sunday to Easter Saturday, every day is another Easter, so high is this feast. A beautiful devotion during the Octave of Easter is devotion to the Divine Mercy. 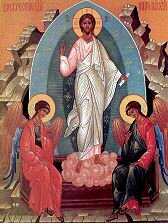 During Easter we commemorate our redemption, when the gates of heaven were thrown wide open, and we were saved through the death and resurrection of Christ. Jesus is calling us, poor sinners, to immerse ourselves in his mercy, particularly on Divine Mercy Sunday, the second Sunday of Easter. On Good Friday the Divine Mercy Novena began in preparation for this Feast of Mercy. During this week we can continue praying this novena. We celebrate this "Mercy Sunday" by going to Confession (preferably before that Sunday) and by receiving Communion on that day.